There is no question that the San Antonio Spurs have been the most successful team in the NBA this season as they have defied the odds all season long and remained relatively healthy throughout the majority of the NBA regular season. With just 14 losses on the season, the Spurs have been incredibly tough to beat at home and away, but they have struggled as of late with two devastating losses to the two-time defending NBA champion Los Angeles Lakers and the revamped Miami Heat. Along with losing to the defending champs and LeBron James’ squad, the NBA leading Spurs also recently fell to the Denver Nuggets (115-112) in the Mile High City. This was obviously a very close game as the Spurs were almost able to come away with the win, but without their All-Star big man and face of the franchise in Tim Duncan (ankle) this team has become vulnerable inside the paint. On Friday night, the San Antonio Spurs will try to get back on track with a win over the Portland Trail Blazers at the Rose Garden. This will be no easy task as the Blazers are fighting for playoff position right now in the Western Conference and the Spurs will be without Duncan once again as he will miss this three-game road trip (Denver Nuggets, Portland Trail Blazers, Memphis Grizzlies). As for the playoff seeding for the Spurs, San Antonio is sitting pretty at the time being as they are six games ahead of the Los Angeles Lakers and seven ½ games ahead of the Dallas Mavericks. With just 11 games left in the NBA regular season, the San Antonio Spurs will almost certainly clinch the top seed in the Western Conference; unless they have a complete meltdown in this few games of the season and the Los Angeles Lakers stay hot before the playoffs. 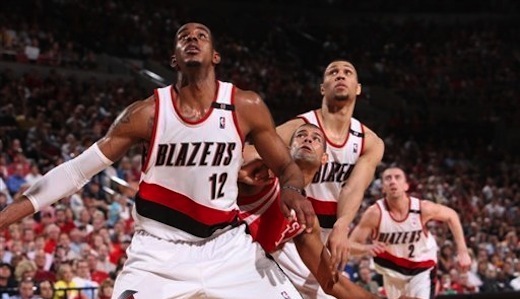 Coming into this matchup with the Portland Trail Blazers, LaMarcus Aldridge and company have won seven out of their last ten games and will be looking to get closer to clinching the five seed in the West as they are battling the Denver Nuggets who are a game and a half ahead of them. tar snub forward LaMarcus Aldridge. Without Tim Duncan in the paint, the Spurs will be seriously exposed in this game and could be headed for a second consecutive loss if they can’t find a way to contain Aldridge on the block. Without Duncan, these two teams matchup fairly well, but there is one mismatch that might ultimately tilt the scales in the Spurs favor as the Blazers will have trouble guarding Manu Ginobili. In the end though, I see the Blazers coming out on top in this one as the Spurs will struggle against Portland on their home floor at the Rose Garden. « Is the Chicago Bulls Derrick Rose this season’s NBA MVP?